We recommend checking out our discussion threads on the Lectrosonics UCR411A - 400 Series Wireless Diversity UCR411A-21, which address similar problems with connecting and setting up Wireless Receivers Lectrosonics. 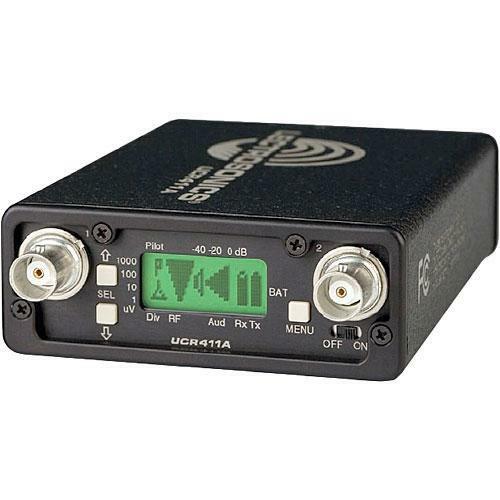 The user manual for the Lectrosonics UCR411A - 400 Series Wireless Diversity UCR411A-21 provides necessary instructions for the proper use of the product Pro Audio - Location Sound - Wireless Receivers. The Lectrosonics UCR411 is a portable, camera mountable receiver designed for professional audio applications in the field or indoors. The receiver is completely compatible with all 400 series wireless transmitters and provides 256 selectable UHF frequencies across a 25.6MHz tuning range. Smart Diversity reception reduces RF interference and dropout and a built-in RF spectrum analyzer searches across the entire 25.6MHz tuning range, locating the strongest possible frequencies in the area. The clear frequencies are marked and displayed on the backlit LCD. Balanced XLR output provides maximum output gain with minimal noise and the receiver is powered with internal 9V batteries or external DC power supply. Box Dimensions (LxWxH) 14.1 x 10.5 x 4.3"
The user manual for the Lectrosonics UCR411A - 400 Series Wireless Diversity UCR411A-21 can be downloaded in .pdf format if it did not come with your new wireless receivers, although the seller is required to supply one. It is also quite common that customers throw out the user manual with the box, or put the CD away somewhere and then can’t find it. That’s why we and other Lectrosonics users keep a unique electronic library for Lectrosonics wireless receiverss, where you can use our link to download the user manual for the Lectrosonics UCR411A - 400 Series Wireless Diversity UCR411A-21. The user manual lists all of the functions of the Lectrosonics UCR411A - 400 Series Wireless Diversity UCR411A-21, all the basic and advanced features and tells you how to use the wireless receivers. The manual also provides troubleshooting for common problems. Even greater detail is provided by the service manual, which is not typically shipped with the product, but which can often be downloaded from Lectrosonics service. If you want to help expand our database, you can upload a link to this website to download a user manual or service manual, ideally in .pdf format. These pages are created by you – users of the Lectrosonics UCR411A - 400 Series Wireless Diversity UCR411A-21. User manuals are also available on the Lectrosonics website under Pro Audio - Location Sound - Wireless Receivers.